My Grandfather PJ O'Loughlin (mentioned in one of my other blogs) was a great GAA man and loved to be part of organizing games - in effect, he was one of a small army who helped to run the GAA, especially in his native Newmarket in Co Cork, and in Carnew in Co Wicklow. None of his children or grandchildren were to follow his footsteps into getting involved in running the GAA, though some of us did grace the football and hurling fields (I played football for FCJ School in Bunclody, and for the 2nd team in Trinity). There's not much on the web about PJ. I first came across a website with his picture when looking to buy a Christmas present of a Wicklow GAA jersey for my brother Brian. Given Wicklow's lack of success, their jerseys are not much in demand and are hard to get! While looking at the Leinster GAA website, I came across an archive of old photographs. 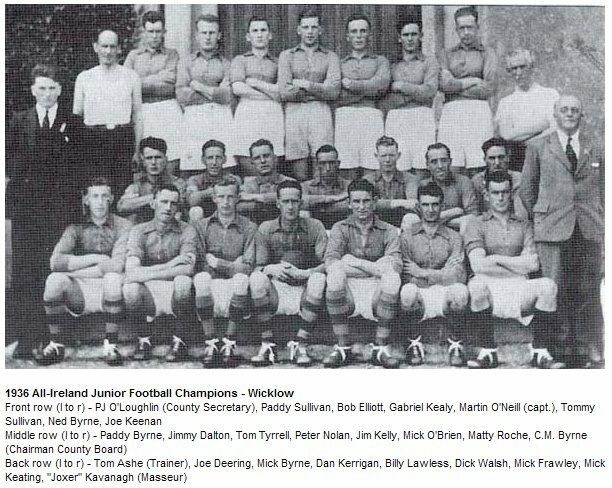 Much to my surprise, there is PJ pictured beside the victorious Junior All-Ireland winning Wicklow team in 1936 in his capacity as County Secretary. PJ O'Loughlin was County Secretary of the Wicklow GAA from 1935 to 1940 - he is listed under the Irish spelling of his name (P.S. Ó Lochlain) on the History page of the Wicklow GAA website. Interestingly he is listed as being from Tomacork - this is the parish where he, my Dad Joe, and I grew up (and I served Mass in Tomacork church!). There was no GAA team in Tomacork - Carnew Emmets are the local team which PJ was involved with. The only other place on the web that I found a reference to PJ is on the website of the local GAA team in his native Newmarket. 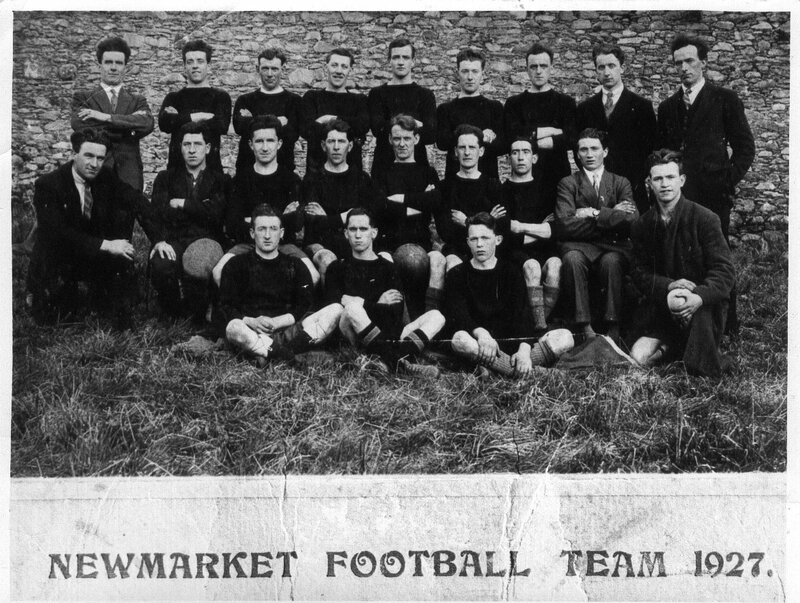 It was a strange story that led me to find another picture of him - this time with the 1927 Newmarket football team. To see the picture, click here. Here's how I came across this picture: A Newmarket man called Dan Casey contacted my father who was looking for a death certificate for my Dad's aunt Mary O'Loughlin (who died in the 1940's). Apparently proof of her death was required in relation to a local right-of-way issue. During their conversation, Dan told my Dad that there was a picture of PJ on the Newmarket website. Dad has no access to the Internet so he asked me to look it up for him. I found the picture but did not see a great resemblance between a man in the photo called "Paddy O'Loughlin", and the 1936 photo mentioned above. I used the contact form on the website to enquire further and to see if I could get a hard copy of the photo. A man called Timothy Hourigan responded and was very helpful - offering to send me a copy of the photo. We swapped many emails and it turns out that Timothy and I are third cousins! His great-grandmother Bridget O'Loughlin is my great-grandfather's sister. Timothy's sister, Catherine, started this picture hunt as she mentioned to Dan Casey to say it to Dad that there was a picture of PJ on the Newmarket GAA website. It's a small world! Anyway, I showed a copy of the photo on my computer to my Dad who instantly recognised his father. 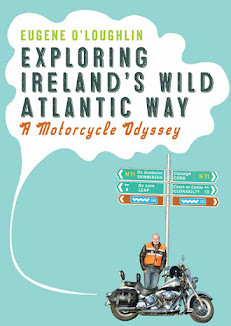 He also told me that though he was always known as PJ, that my grandmother (Kathleen) called him "Paddy". Timothy kindly sent a hard copy of the photo to my Dad. Timothy also amended the caption on the photo to refer to my grandfather as "PJ" instead of "Paddy" O'Loughlin.